Just when I am feeling like some people in the copyright industry are getting their act together, there are news that make me rethink my patient and measured approach to the issue of global intellectual property. The International Intellectual Property Alliance (IIPA) has submitted this year’s Special 301 recommendation list to the United States Trade Representative. For those unfamiliar with this figure, the Special 301 status is the biggest stick in the USTR arsenal, it is the equivalent of being placed in the trading naughty list. One of the most infamous features of the list is that it allows various industry organisations to submit their recommendations on who should be named and shamed this year. I am neither surprised nor upset by the addition of Costa Rica to the list, to be fair our enforcement is atrocious. Similarly, I am not surprised by most of the other recommendations, which seems like a rehash of past offenders. What I found rather surprising is that the IIPA seems to be using their Special 301 submission to attack open source software. According to Digital Copyright Canada, several countries are being included in the Special 301 watchlist because they have open source-friendly policies, or in their words, the IIPA would rather people “pirate” than switch to legal competitors. This is quite a claim, so I have been going through the reports to verify it myself. The country reports for Brazil, India, Philippines, Vietnam and Thailand certainly contain some comments about open source software. Particularly, the IIPA seems to be concerned that these countries have enacted or are in the process of enacting legislation that will make it obligatory for public entities to choose open source software over its proprietary counterparts. I have to admit that I somewhat share the IIPA’s concerns in this regard. I have never believed in open source procurement legislation, I think that forcing institutions to use a specific technical solution is wrong. Open source is an organic, bottom-up movement, and making it state policy seems not only counter-productive, but contrary to the very same principles of openness. Open source should not be imposed, it should win on its own merits. So, reducing costs and piracy translates into denying companies access to the market and affects innovation. Read here, Microsoft and others will have to compete with Open Office. I am baffledby the mindset that believes encouraging public institutions to use legitimate and free open source software solutions “does not give due consideration to the value to intellectual creations”. Chew on that phrase for a moment. Open source software has no value because it is free, so anything that encourages open source has the opposite effect, namely, it “fails to build respect for intellectual property rights”. It is nice to know where the IIPA stands. Only commercial intellectual property is worthy of protection, everything else is as bad as piracy. This phrasing does not imply open source companies as illegitimate. But it does establish that companies developing closed source software are denied access to the government market, which is wrong. They can choose to participate (a) developing free software software as well as the other companies or (b) licencing software they develop as a free software. The phrasing also establishes erroneously that the policy "does not give due consideration to the value to intellectual creations". Erroneously, because value can be measured in many different ways one of which is monetary value. FOSS companies can develop software the way the government need, but probably won't work for the government at no cost, so the policy does encourages a mindset that "give due consideration to the value to intellectual creations". As for "intellectual property rights" part, the phrasing is confusing and wrong. It says that because the policy induces "a mindset that does not give due consideration to the value to intellectual creations", "it fails to build respect for intellectual property rights". "Value to intellectual creations" is independent of "respect for intellectual property rights", so how come they establish a cause/effect relation? Ignoring the falacies, the recommendation text can be plainly understood: some software companies that comercializes software in a way that some countries are trying to rule unacceptable, are trying to impose general trading restrictions to these countries. In other words: the model of software comercialization in which by using the software you are obliged to the will of the software developer, cannot be substituted by another model in which you aren't, and if you try it you may face trading restrictions. Uncle B, don't drag capitalism into this. I am a capitalist and yet I, just like every other (true) libertarian, want to abolish everything that has to do with "intellectual property". Free software if _free_. Libertarianism promotes individual freedom. So I disagree with the picture of open source ~ socialism or communism. 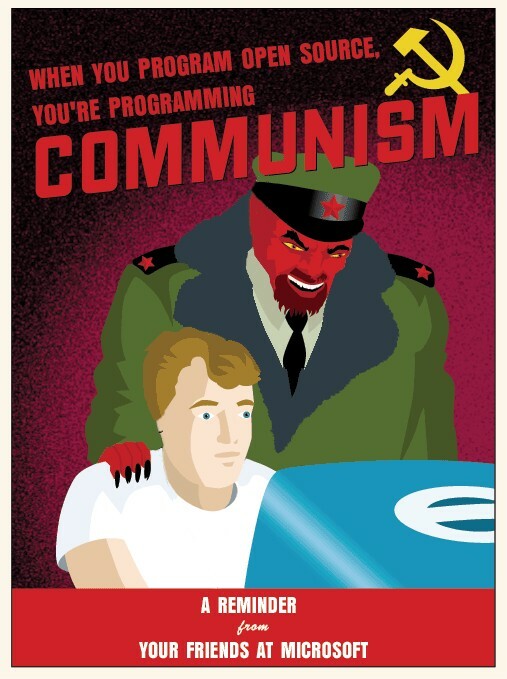 Socialism is like a boss who does not allow you to put your software under the BSD license (or any other free license alike) but rather takes the code and distributes it as _he_ likes. Communism is when he takes the code and distributes it to everybody but only give people a piece of the code so that none is satisfied. what is IIPA up to with its report complaining that Indonesian government encourage the use of FOSS ? dont they know by using FOSS we can be legal at affordable cost and alternative to piracy software ? Also the report encouraging Indonesian government(GOI) to reconsider the cancelled MOU between GOI and Microsoft because the MOU is strange.. its an MOU but the addendum looks like an invoice with quantity, schedule of implementations for the government to purchase licenses ? This seems not the juridictions of USTR and interfering with domestic affair of other country and government procurement ? if you look at the statistics there are more Apache webserver than IIS in the world today… so you are wong asking who might use Apache? Linux is 10 years behind Windows… but see what software like Ubuntu can do in 5 years to come ? That's why IIPA is so worried about FOSS move in the emerging countries. I think you missed the sarcasm in anon's post. if FOSS give solutions to country such as Indonesia and other developing country to have alternative cheap solutions for bridging digital divide..why should IIPA and USTR complain about Indonesian government attempt to have cheaper way to be in par with the rest of the world ? FOSS (free and open software) also a solutions to reduce piracy so why should IIPA complain if it help solve the piracy problem they are fighting for ? or they fight for something else ? You must distinguish between the goals of these organizations and the claims that they make to advance those goals. The goal that western software companies want is not to reduce piracy per se, it's to increase their revenue by selling more copies of their software. The battle against "piracy" is simply a method to achieve that aim. Methods such as having their customers or potential customers switch to open source are diametrically opposed to that aim. A good book that discusses the "copyright wars" in detail is William Patry's Moral Panics and the Copyright Wars. One day, from China, or India, will come a universal computer language – not form America! They can hardly lead the world while stuck on $Microsoft! On day America will sink into 'Proprietary Secret' Hell, as the rest of the world advances, past them and into the new, exciting, 21st century! Much as Thorium fueled, safe, clean nuclear reactors have been held back by American, commercial, capitalist, corporative reasons, computer smarts have been limited to $microsoft, with no competition even! Simply not progressive capitalism, but protective, limiting capitalism – not good. Open source is a tricky kind of thing. Although Linux distributions like Ubuntu are great, I prefer something that "just works" like OSX. forums that are across the identical subject areas? Many thanks!